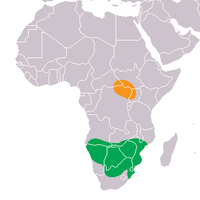 The white rhinoceros original range (orange: Northern (C. s. cottoni), green: Southern (C. s. simum)). The white rhinoceros or square-lipped rhinoceros (Ceratotherium simum) is one of the five species of rhinoceros that still exist and is one of the few megafauna species left. It has a wide mouth used for grazing and is the most social of all rhino species. The northern subspecies has all but died out; the southern is rare.